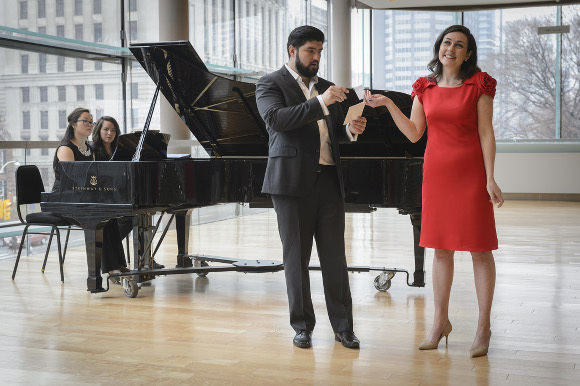 The Canadian Opera Company has just announced the 2015/16 season line up for the free lunchtime concert series in Richard Bradshaw Amphitheatre. Now under the curatorship of Claire Morley there’s the usual incredible array of chamber music, dance, piano, jazz and world music as as well as, of course, the vocal series. In that department there are some twenty concerts involving visiting COC artists, Ensemble Studio members, the Canadian Art Song Project and more. The visiting stars include Anita Rachvelishvili, Clémentine Margaine, Quinn Kelsey, Christopher Purves, Josef Wagner (doing Winterreise no less) and Russell Thomas. More local performers include Simone Osborne (Strauss yay!) and Doug MacNaughton. This year’s CASP commission is a new setting of Baudelaire poems by Erik Ross to be performed by Ambur Braid and Stephen Philcox. There’s also an Arraymusic concert celebrating female composers and the female voice with music by Barbara Monk-Feldman and Linda Catlin and an appearance of regular combo, Bob Pomakov and the Gryphon Trio. The full line up is here. This entry was posted in Toronto opera news and views and tagged brais, coc, kelsey, margaine, osborne, phicox, pomakov, purves, rachvelishvili, rba, thomas, wagner by operaramblings. Bookmark the permalink.